I thought I hit record this week, but I didn’t, and with only one service because of St. Mark’s Annual Meeting, I failed to capture the audio for this sermon. Apologies. Three weeks ago, we began an Epiphany sermon series in which we are imagining our way into God’s eyes and trying to see ourselves as God sees us. What is God’s point of view? What does God see, name, and celebrate about us? And how can we incorporate that divine point of view into how we interact with God’s creation? We began with Belovedness. God sees and names us and each person we meet as God’s Beloved. Living in this reality means affirming in word and deed the dignity and value of all people. Next we talked about God befriending us. God calls us into mission alongside God, not as subjects or employees, but as partners, friends. And this friendship leads us to create strong relationships of our own. Love leads to friendship, which leads us out into the world, participating in God’s mission of healing and reconciliation. Here we claim our giftedness, not to make ourselves feel special, but to use our gifts to make others feel so. We claim our giftedness, which helps us be blessings in the world. Have you ever wondered why we say, “Thanks be to God” at that particular moment at the conclusion of a scriptural reading? If you haven’t, don’t worry: I didn’t wonder why until I started writing this sermon. Saying “Thanks be to God” seems rather strange at first. For what are we really thanking God? Honestly, this thanksgiving would make much more sense if the reader herself were the one offering it. I can imagine the reader thanking God for the lack of unpronounceable names in the lesson; or for the ability to pronounce Melchizedek and Nebuchadnezzar on the first try; or for the opportunity to serve God in the capacity of reading the Bible aloud. But the question remains: why do we respond with thanks to God when the reader says, “The Word of the Lord”? This morning’s lesson from Genesis provides an answer. But first, here’s a quick recap of the first few episodes of Abram’s story. God tells Abram to leave his country and set out for a new place, which only God knows about. So Abram, his wife Sarai, his nephew Lot, and their household set out on a journey. They wander through Canaan and down into Egypt, where Abram gives his wife to Pharaoh to save his own skin. But when a great plague hits Egypt, Pharaoh realizes Sarai’s already married, and he sends her back to her husband. Abram and Lot part ways because their herds have grown too great to share the same land. Finally, Abram settles by the oaks of Mamre. Soon after, he takes part in a battle among the local kingdoms. And on three separate occasions during these adventures, God tells Abram that God will give him offspring and make of him a great nation. But Abram worries because he remains childless. He’s getting on in years. Sarai is barren. He’s rich and powerful and secure, but the one blessing he desires above all else has eluded him. He has no descendants to inherit his land. A slave born in his house will have to be his heir. Eliezer of Damascus is going to get everything. How does this fulfill your promise, God? In this way, Abram questions God when the word of the Lord comes to him in a vision. Half in accusation, half in resignation, Abram states the situation bluntly: “You have given me no offspring.” And during this moment – during Abram’s most anxious, most doubtful, most defeated moment – the “word of the Lord” comes to him. The Word of the Lord comes to him and says, “No one but your very own issue will be your heir. Look toward heaven and count the stars, if you are able to count them. So shall your descendants be.” The Word of the Lord comes to him and gives Abram the strength to believe that God will fulfill God’s promise. This is the same “Word of the Lord” for which we twice give thanks on Sunday morning. You may ask: “How can mere words give Abram such strength? What if the promises are empty? Where’s the action to back up the talk?” Okay, I’m about to say the “H”-word and I need you to stay with me for just a minute here. Genesis was originally written in Hebrew. Translators do the best they can to render the original language into English, but sometimes a Hebrew word is just too deep and complex for a single English word to suffice. In these cases, the English is like looking at a picture of a cake. The Hebrew is like taking a big bite of the cake itself. Such is the case with the word “Word.” In Hebrew, the “Word” is not simply speech or writing on a page. The “Word” happens to people. The “Word” is an event, an encounter, an action that calls for further action. In the beginning when God created the heavens and the earth, God spoke creation into being: “God said, ‘Let there be light’ and there was light.” The Word of the Lord happened, and, as a result, creation came into existence. When the Word of the Lord happens to Abram, he finds the strength to go on trusting God in spite of all the reasons why God’s promise seems preposterous. And when we hear a reading from Holy Scripture on Sunday morning, we respond “Thanks be to God” because the Word of the Lord has just happened to us. In that encounter with the Word, we are aware that God continues to speak us into existence. And from existence into service. And from service into love. And from love into the transformation that happens when we follow Jesus Christ our Lord. You see, when the Word happens to us, we are changed. We may be changed minutely or momentously, but we are changed. We may be changed slowly or suddenly, but we are changed. We are changed into better lovers of God, better servants of other human beings, and better human beings ourselves. In Abram’s case, the Word happens to him, and the change comes slowly. The Word gives him trust in God’s faithfulness, but at first Abram fails to understand the expanse of God’s miraculous promise. Abram doesn’t realize that God desires not just Abram’s own offspring, but Sarai’s, as well. So Abram bears a son with Hagar, his wife’s slave-girl. But the Word isn’t finished happening to Abram yet. Years later, Abram stumbles into God’s presence again, and God renews his promise a final time. In the pivotal sign of the change, which the Word has on Abram’s life, God changes his name to Abraham and Sarai’s to Sarah. Soon after, Sarah bears Abraham a son named Isaac, and the countless generations that follow rival the number of stars in the heavens. I invite you to reflect on how the Word is even now happening to you. Is the change, which the Word is causing in your life, so constant that you don’t feel the difference until there is one? Or is the Word blowing you away and making you into something different, something new, in an instant? Either way, know that our Creator continues to speak creation into existence. Our Creator writes the Word on our hearts. Our Creator puts the Word on our lips so we may speak love and welcome to all we encounter. The reader says “The Word of the Lord” to make us aware that the Word is happening to us even now this morning while we sit in our pews. We respond “Thanks be to God” to show our gratitude for God’s movement in our lives. But the Word isn’t through happening to us yet either. The Word happens to us to enable us to serve and to love. The Word impels us to go out into the world and invite others to notice the Word happening to them. As followers of Christ, we live with the joyful expectation that the Word will happen to anyone, anywhere, at any time. And when the Word happens to us, we will be changed. 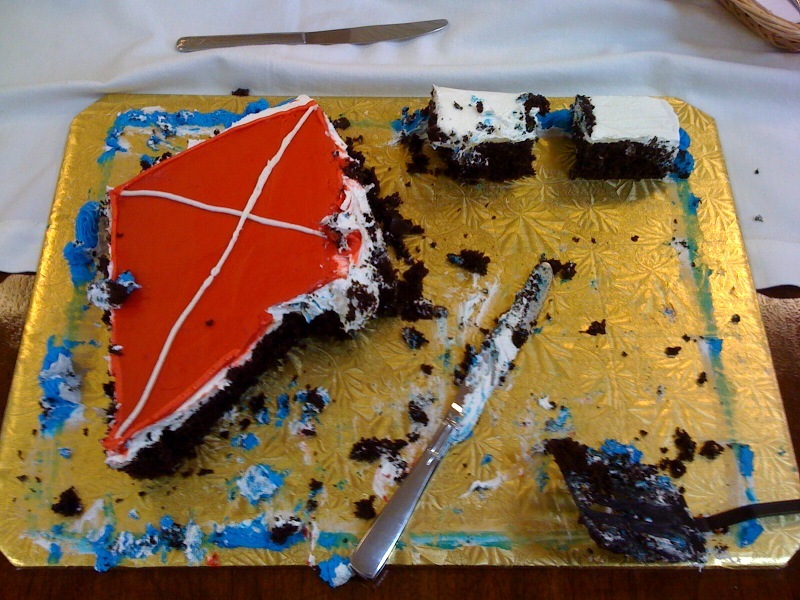 Speaking of cake, the day I preached this sermon was my first at the church to which I was recently called to be the Assistant Rector (Assistant to the Rector, Dwight!). 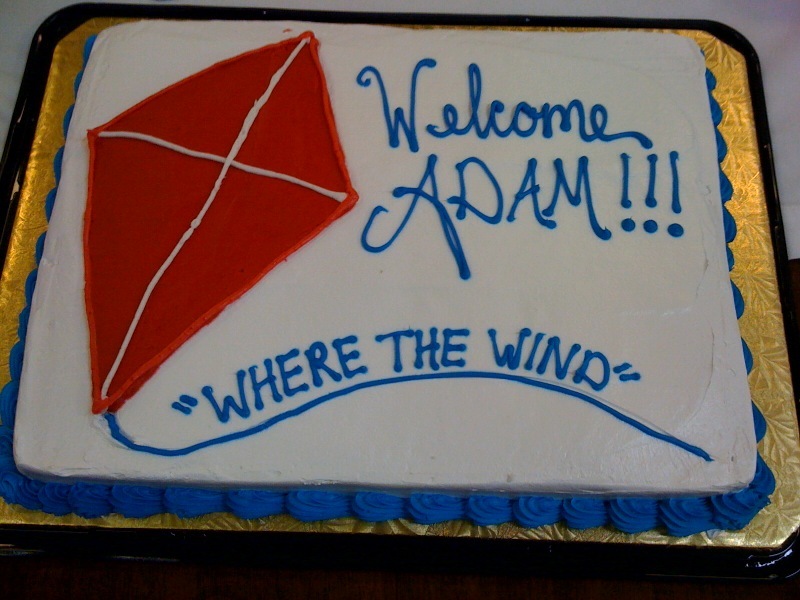 They got me this cake, which is awesome. Then, the kids ate it. This relationship which God has extravagantly blessed us with challenges the understanding of God’s immutability. Indeed, in the story, it seems (at first glance at least) that Abraham is swaying God’s mind. Many, if not most, ancient and medieval Christian thinkers assert that a facet of the divine is changelessness. This makes sense because the perfect cannot be changed; if it could, it would not be perfect. However, I think that assigning platonic categories of perfection to God is a silly exercise because God is beyond our concept of perfection. * God is more than perfect because God subsumes the category of perfection into God’s being. That is why God can send a son to earth against all the rules of fashionable Greek philosophical discourse of the time. God is other, but God is present at the same time. What we call Providence, as theologian Paul Tillich says, is the intermingling of our actions and inactions with God’s directing creativity. Part of this directing creativity is responsiveness to prayer. Tillich says that “every serious prayer contains power, not because of the intensity of desire expressed in it, but because of the faith the person has in God’s directing activity—a faith which transforms the existential situation” When Abraham says “Far be it from you to do such a thing” (which might more expressively be translated: “How dare you!”), he is engaging in this kind of prayer. The relationship he has with God, more than the words, is the important factor in the exchange. While it might seem that Abraham is using his close connection with God to sway God’s mind, God seems to let the exercise go on to expand Abraham’s mind concerning justice, righteousness, and sin. Abraham’s thought experiment is flawed to begin with because there is no way to separate the righteous and sinful. Even in generations to come when it was possible to be “righteous under the law,” people kept the temple in business by sacrificing to restore their righteousness. Later, Paul reflects this reality when he says, “There is no one who is righteous, not even one” (Romans 3:10). But Abraham’s seems to say, “For argument’s sake, let’s say there’s a clear distinction between the righteous and the sinful.” God humors him thus far. Next, Abraham makes an outrageous claim that would make any level-headed person cry foul. He says, “Shall not the Judge of all the earth do what is just?” Abraham is outraged that the righteous would be swept away with the wicked. However, he is perfectly content with the wicked remaining unpunished if even ten righteous people are found in the city. Surely, this is not justice—the wicked go unpunished for the sake of the righteous, the wicked don’t get what they deserve! Now, we all know the end of the story—Sodom gets utterly destroyed. But leaving that aside for a moment, let us pause and reflect on God’s mercy as this story elucidates it. Mercy is not getting what you deserve. It seems that as Abraham lessens the number of righteous needed to save the city, the mercy (rather than the justice) of God expands to greater and greater levels. If only ten are found, you won’t destroy the city? Heck, what about one? We never get that far, but it is not unimaginable. By the end of the story, it seems that the ten righteous are on vacation, and the city is destroyed anyway. But the extravagant claim about God’s mercy still stands, though Abraham can’t see it because of his preoccupation with justice. This story is finally about two things that relate to each other. The first is the human inability to comprehend God and God’s action in the world. The second is the realization that humans are always in the presence of God, participating in that same action. C.S. Lewis says: “The freedom of God consists of the fact that no cause other than Himself produces His acts and no external obstacle impedes them—that His own goodness is the root from which they all grow and His own omnipotence the air in which they all flower” Our incomprehension stems from the actions of God having God’s freedom as their basis and warrant. We are in God’s presence because of God’s goodness. We participate in God’s freedom even when (or especially when) we question God as Abraham does. We participate in God’s goodness when our actions bring about the justice, mercy, and grace of God. And we participate in God’s omnipotence when we are blessed with those briefest of glimpses of God’s directing creativity, which spur us to greater action and greater love. Thinking we understand the ways of the world, and of God, for that matter, is a major cause of all kinds of unrest. I have been a student for nineteen years and one piece of learning that has quietly crept up on me as the years rolled by is this: there sure is a heck of a lot I don’t know. Most of my personal failings come from me thinking I know things that I don’t know. Recognizing that I do not know something is, I believe, one of God’s repetitious lessons in humility. I know so little about the world that I can see and feel and touch. If I know so little about what is actually knowable, how could I ever presume to know anything about God? About why God does what God does? And for that matter, whether or not why is even an appropriate question when God is involved? These musings stray into the territory of an apophatic* understanding of God, but I assure you, I will not quite get there. One needs only to look at the story this reflection concerns to know that God, while supremely unknowable from our end, makes God known to us in both ordinary and mysterious ways. Indeed, Abraham talks to God! The simple fact that there are two characters in the scene—Abraham and God—illustrates the immanence of God in our midst. It is when we turn this around and realize that it is really we who are in God’s midst that the transcendence of God smacks us square in the forehead. God is beyond our knowledge, but because of God’s grace we are not beyond glimpses of the recognition that we think, move, act, love, live in the presence of God. This is revelation, of which Jesus Christ is the most perfect example. We live in the presence of God whether we recognize it or not. However, as our eyes adjust to the holiness around us, the injustice of the world becomes more apparent and more intolerable. Questions such as why do we suffer? and why are the good punished and the evil rewarded? and why does the world seem to be in inexorable decline socially and environmentally? abound when we link our experience of our Creator with our moral compasses. C.S. Lewis, in The Problem of Pain, begins with a discussion of religion in general. He says that the roots of religion are two-fold: the universal, uncanny, dreadful, unexplainable something that he calls experiencing the “numinous”; and the emergence of morality. The Jewish people, he continues, were the first to combine these two things when they discerned that their God both prompted them to live a life of good morals and helped them along the way. As the understanding of God as a necessarily “good” being grew, the aforementioned questions became more prevalent. Indeed, if we were without our understanding of God as a beneficent Creator, then there would be no problem associated with injustice or pain. They would simply be neutral facts, as indistinguishable from their natural counterparts as colors in the dark. However, we are blessed with the revelation that our God is good. This is both a comforting and a vexing thought. Abraham takes the vexation head on. In doing so, he accuses God of premeditated capriciousness and also shows just how poorly he, Abraham, understands the concept of justice. “Will you indeed sweep away the righteous with the wicked?” says Abraham. Here Abraham wrestles with what might be termed “Divine inscrutability.”** What looks like capriciousness to humans, goes one interpretation, is God fulfilling God’s inscrutable plan. This quickly becomes the “It’s God’s will” argument. However, this progression is inherently flawed. There is obviously a paradox happening somewhere when inscrutability and knowledge of God’s will are mentioned in the same breath. These two approaches seek to answer the “why” question (why did God let this happen? etc). Inscrutability says, “I don’t know why.” The God’s will argument says just that—“It’s God’s will,” no matter what happens. The latter is a very limited understanding of our relationship with God. While the “will” of God certainly exists, it is not the organizing principle by which we live. That is, instead, reserved for the “Word” of God, which is both the foundation of existence and the incarnate being of Jesus Christ. Affirming this premise does not answer the “why” question, but supersedes it with the person of Christ, who is present with us in our pain and suffering. The inscrutability of God is maintained because we can never fully know God, but our questions are answered by a relationship with Jesus Christ (rather than an explanation). ** Inscrutability is a funny word. You can be inscrutable, but can you just be scrutable? In think you can in Europe. Abraham stares after them as they make their dusty way down into the valley. They are men to his eyes, and yet, in the shadow-stretched twilight they appear indistinct, almost shadows themselves. But not shadows; for these beings shine. They shine with the borrowed light of the one who remains with Abraham on the hilltop overlooking the candlelit city of Sodom. Abraham watches them until their shadows mingle with those of the scrub and gorse bushes. He stands there, mystified—for they have just predicted that Sarah (his Sarah!) would get pregnant. Ha. She’s far too old, her joints too arthritic, her bones too brittle to stand the strains of pregnancy. And yet. And yet they had seemed so certain. She had laughed, but it was no joke. I thought I understood the ways of the world, ponders Abraham, as the shining beings melt into the candlelight of the city. I thought I understood the ways of the world. Perhaps not, if it is true that Sarah can still bear children. Confusion. Abraham shakes his head, as if this act would jostle loose such a silly, irrational thought as Sarah becoming pregnant. He looks down at Sodom again. And here’s another example of irrationality, he thinks. Anger kindles in his chest as he remembers the abuses that have reached his ears, the abuses committed by the people of that city. But yet—how could God destroy that place if there were righteous people there. Surely God could not be that unjust. Abraham shakes his head again, this time with suppressed incredulity, and lifts his eyes from the twinkling lights below. He turns and approaches the third being, the one who has remained with him on the hill when the others ventured down to the city. Seen peripherally, the being is generally man-shaped. But as Abraham moves near, he perceives how inadequate a container the man-shaped body is for such an abundance of light, harmony, and awe. Abraham suppresses a shudder. He opens his mouth, but closes it again, unsure whether he wants to question or accuse. The being knows the confusion in Abraham’s mind, knows that such cognitive dissonance is the birthplace of revelation. All at once, Abraham finds his words: question and accusation combine into indictment tinged with desperate plea for understanding. “Will you indeed sweep away the righteous with the wicked?” He presses on, not waiting for the LORD (for, of course, this is who the luminous being on the hilltop is) to respond. “Suppose there are fifty righteous within the city; will you then sweep away the place and not forgive it for the fifty righteous who are in it? Far be it from you to do such a thing, to slay the righteous with the wicked, so that the righteous fare as the wicked!” Abraham points a quivering, accusatory finger, and his pitch rises as the cause of his mental distress tumbles from him: “Far be that from you! Shall not the Judge of all the earth do what is right?” Tears form at the corners of his eyes; he slumps over, chest heaving with the exertion of voicing the thoughts that have been building ever since the three men approached his tent. * This and the upcoming two posts are pieces of a reflection on Genesis 18.